Investigators from the Alberta Sheriffs branch have closed a problem property that was a magnet for drug activity in southeast Calgary. The Safer Communities and Neighbourhoods (SCAN) unit of the Alberta Sheriffs Branch has obtained a court order giving them the authority to close a drug house at 5106 Erin Pl. SE in Calgary for 90 days. The Safer Communities and Neighbourhoods (SCAN) unit obtained a court order giving investigators authority to close the home at 5106 Erin Pl. SE for 90 days. The property has been boarded up, the locks changed and a fence has been up around the house. The owner and any occupants are required to leave the property for the 90-day period. 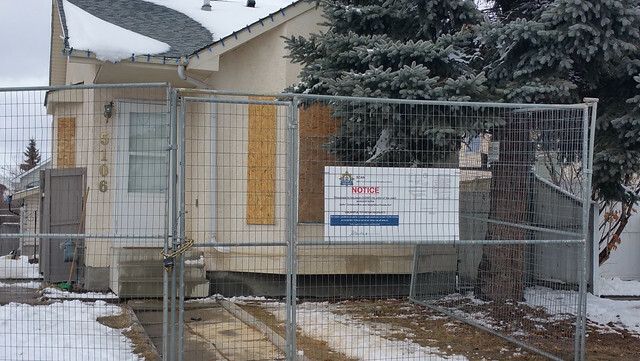 The SCAN unit first began investigating this southeast Calgary property in April 2017, following complaints about drug activity, including a high number of vehicles visiting the property. During the investigation, SCAN members obtained evidence that confirmed drug activity. On March 23, 2018, SCAN obtained a Community Safety Order (CSO) in Court of Queen’s Bench following negotiations with the property owner. The owner consented to the 90-day closure, which will remain in effect until July 12, 2018. SCAN works with other law enforcement agencies to shut down properties being used for illegal activities. SCAN investigations are conducted by sheriffs with specialized training to enforce the Safer Communities and Neighbourhoods Act, which gives them the option of targeting problem properties through civil enforcement. Since its inception in 2008, SCAN has investigated more than 4,200 problem properties across Alberta and has issued 72 CSOs. The majority of complaints are resolved informally, with no need for legal action, by working with property owners to resolve issues. SCAN Insp. Mike Letourneau will be available between 1 p.m. and 1:30 p.m. on Tuesday, April 17 for on-camera interviews at 5106 Erin Pl. SE, Calgary. Minister of Justice and Solicitor General Kathleen Ganley will be available to speak about SCAN’s work at 1:20 p.m. on Tuesday, April 17 in Edmonton on the third floor of the legislature.